Prismacolor's double ended brush markers continue the level of quality of their original double ended art markers while expanding the range of mark-making possibilities. 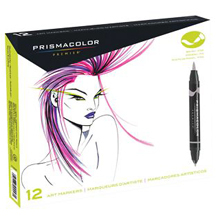 Prismacolor Premier Art Markers are professional artist-quality colours with advanced ink formulations. It's an alcohol, dye-based ink that's non toxic. 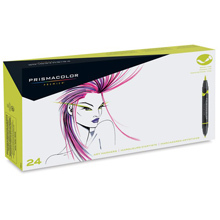 Each marker provides rich colour saturation with smooth, silky ink flow and coverage. One ink source ensures color consistency from either end of the marker.